D’Easter Wonderland by Sample Store! Sample Store is having an eggciting Easter event in April filled with lots of fun activities for the whole family! Now for those of you who don't know, Sample Store is the first & top tryvertising platform in Singapore that offers FREE samples and FREE membership. Sample Store has 100 different products & services ranging from beauty, household, food & beverages. In Sample Store, they've something for everyone regardless if you’re a woman, man or kid! The best part? ADMISSION IS FREE!!! There will also be hourly lucky draws where you can win prizes worth up to $2000! You'll also get bring an exclusive goodie bag worth more than $100! There will be fun for everyone with an Egg Painting Contest, Egg Hunt Adventure, Alice in Wonderland mini live show, Magic Show, Bouncy Castle for the kids and Mini retail therapy & sampling experience at advertisers booths (beauty and F&B related products & services) for the adults! I'm already feeling so excited just telling you guys about it! 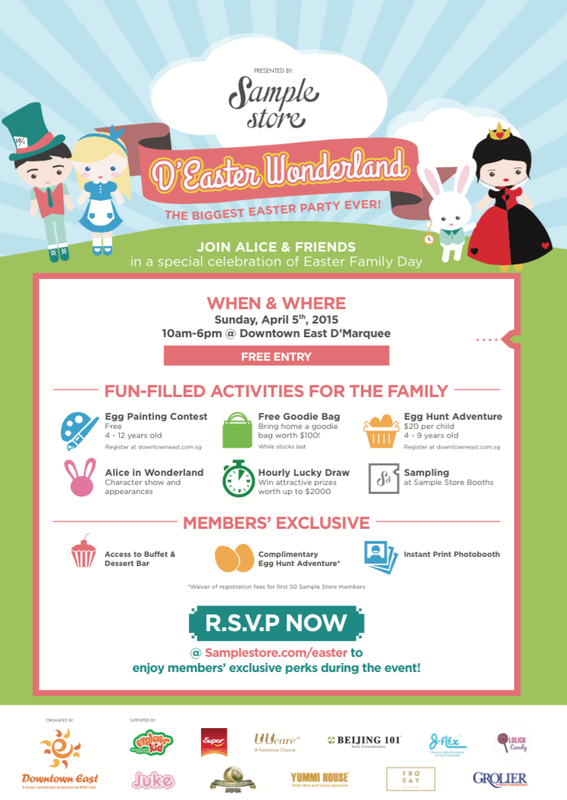 You'll get free access to the buffet & dessert bar, complimentary Egg Hunt Adventure (worth $20/per child) and Instant Print Photo booth that's exclusive to Sample Store Members only! So what are you waiting for? Sign up as a member with Sample Store FOR FREE today via the link below to enjoy these privileges! Kylie, Shane & I will be there too! & We hope to see you there as well! So wait no further! RSVP now & let's have a ball of a time this Easter!